An art cooperative is an organization owned by its members. When starting an art cooperative, find members with different styles of expression and media that will complement members, such as abstract, realism, pottery, photography and sculptures. 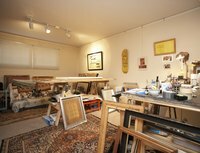 The benefits for an artist to join a cooperative normally includes access to a studio, galleries, education resources and workshops. Members should also be aware they are to share the work equally along with expensive and liabilities. Create a core group that consists of people that are excited and willing to work to get the art cooperative going. Work out a mission statement. A mission statement is putting what the cooperative is about on paper. It normally consists of a few concise sentences. Develop a contract for each member to sign that defines responsibilities and rights between the cooperative and the member. Include termination steps for both parties and how to solve disputes, such as through an arbiter. Include activities the cooperative will offer to members and then assign people to oversee the planning of the activities. Activities examples include newsletters, workshops, website, sales and planning meetings. Assign a person as the treasurer. This person should be comfortable with spreadsheets and working out budgets. Reach out to other artist for membership. Look in places such as schools, pottery shops and galleries. Locate sites to hold meetings and workshop, such as a local art supplier or a cheap rental. Look for inexpensive equipment and supplies from local art studios and sales. Determine the membership fees that will cover workshops and other overhead fees. The larger the membership, the more the cooperative will be able to do. Raise money by organizing a fundraising event or arrange for joint art shows with local galleries. Schedule shows around holidays and themes to create traffic.